Doncaster scored three second-half goals for the second consecutive game as they blew away Wycombe. Mallik Wilks, Joe Wright and John Marquis all found the net after the break as Grant McCann’s excellent start to life as Rovers boss continued. Doncaster were the more threatening side in the opening period but struggled for end product. And it was the visitors who had arguably the best chance of the first half when Adebayo Akinfenwa rose to meet a cross but scuffed his header. Rovers found their clinical edge in the second half with Leeds United loanee Wilks putting them ahead after 55 minutes, receiving the ball just outside the box and drilling in at the near post. Centre half Wright doubled the advantage after 78 minutes, receiving a pass from Tommy Rowe and slotting past Ryan Allsop from close range for his first goal in senior football. And Marquis put the game beyond doubt ten minutes from time. Substitute Matty Blair slid through a fine pass and Marquis poked the ball past Allsop with the effort trickling over the line. 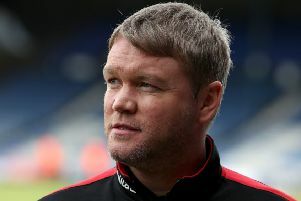 “We’ve scored six goals in 90 minutes over two games,” Rovers boss Grant McCann said. “This group can keep going, they’re fit, they’re strong and we saw that from the second half last week and this week. “When we step on it and put our foot on the gas, we can score when we want.